Last week — the same week that marked the one-year anniversary of the Quebec mosque massacre, the most fatal act of ideology-inspired violence in Canada since 1989 — the Parliamentary Heritage Committee released the fruits of its months-long study on Islamophobia and systemic racism. The entire column is a shrill and all too familiar Islamist apologist whine detailing Canada’s rampant “Islamophobia”. This steaming pile of verbal crap downplays the fact that the bulk of Canada’s security budget is spent monitoring the writer’s bloodthirsty fellow cultists who reside here or have gone off to join ISIS and other murderous Muslim jihad entities at the cost of ignoring organized crime and other threats. To the author Islam is always the victim despite the perpetual killing rampage it wages the world over. The article is an example of the toxic mix of perpetual victimhood and supremacism that Islam’ serves up to indoctrinate its adherents making “Islamophobia” the hoax crime of our time. The cost of Islam to western societies far outweighs the mythical benefits of Islamist immigration. 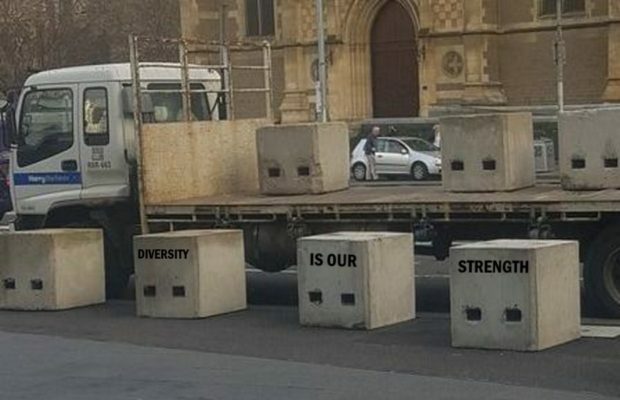 Remember that the next time you bump into a diversity bollard.